The French people had lots to celebrate over the past weekend: the victory of the French national football team, commonly known as Les Bleus, in the FIFA finals as well as their traditional July 14 Bastille Day holiday. Invited to celebrate over dinner with friends, I couldn’t resist making the quintessential French dessert of Cherry Clafoutis. Dust with powdered sugar to serve. I tweaked the recipe a little by reducing the amount of sugar, adding the almonds to the food processor and puréeing them with the batter ingredients, and using half cream and half milk. I used an apple corer to remove the cherry pits, which left much of the cherry intact and looking good. The result was a creamy and not too sweet baked cherry custard and the verdict was overwhelmingly positive: delicious in fact! This is the season for cherries. British Columbia cherries are so sweet and full of flavour at this time of year that a Cherry Clafoutis is a great way to enjoy them cooked. The question is: what wine would I select to serve with this? In keeping with the celebration, my inclination would be a French wine, either a sparkling rosé or a light Beaujolais, fruity and lively. I made two Cherry Clafoutis with one in the freezer, ready to be enjoyed at a later date. When I serve that one I will decide on which of these wine choices to serve. Other wine suggestions are welcome! I am inspired by the magnificent displays of flowers and plants at the Chelsea Flower Show this year in London and sustained by a memorable glass of Louis Roederer Brut champagne. Not just roses catch my eye but hostas, dahlias, alliums and succulent plants all attract attention. Thoughts turn to where I can squeeze in another plant in my garden; what about that Restless Sea hosta? We spend three plus hours at Chelsea, looking at the model gardens, enquiring about various plants in the Pavillion and admiring the garden sculptures in stone and wood. Such creativity and talent on display. We are impressed by the Royal Bank of Canada model garden, inspired by the Boreal forests of northern Canada. RBC wins a gold again this year. On a hot afternoon, a visit of several hours is the best way to enjoy Chelsea Flower Show in my view. In previous years, I have attended for the whole day and my feet have not appreciated my efforts. Life is to be lived forward, helped by looking backward from time to time. What’s this got to do with writing a blog about wine and how it opens the door to other related and interesting subjects? Well, I guess my aim is to deepen and broaden my knowledge about wine and then express it in different ways. I conducted a wine tasting for the Wine Appreciation group at The University Women’s Club of Vancouver at Hycroft. As I plan forward for elizabethsvines in 2017, I’ll be looking backward as well, to see what can be learned from these experiences. The great thing for me about my blog, which I have now been writing for four years, is that it isn’t a job. The only expectations and deadlines are self imposed ones. Oh! And by the way, before I forget to mention it: I enjoy writing elizabethsvines. elizabethsvines November 2016. Wines from my blog: wine tasting event at The University Women’s Club of Vancouver at Hycroft. Inspector Bruno Courreges, gourmand, wine lover and local chief of police lives in the Périgord, SW France in the small town of St Denis, where he knows everyone and their secrets. He enjoys a peaceful life with his vegetable garden, horse, ducks and hens and defends the local community, its people and traditions against threats that menace the traditional way of life. Inspector Bruno also has a weakness for intelligent, independent minded women. Without question, then, he would be supportive of the women winemakers of Bergerac. While I, and I am sure many others, would greatly enjoy meeting Inspector Bruno, there will be no such opportunity as he is the fictional creation of Martin Walker. For myself, I feel I have become acquainted with Inspector Bruno from reading the novels. I have met Martin at a couple of wine events in the Dordogne. After reading the following article in a local Dordogne English language newspaper, The Bugle, I decided to write to him and ask if I could reproduce his article about women wine makers of Bergerac on my website. He has graciously agreed to this and I am very pleased to include his article below. Along with the Universities of Bordeaux, Padua and Melbourne, the Davis campus in California is one of the world’s great wine schools and last year for the first time, half of the graduates were women. 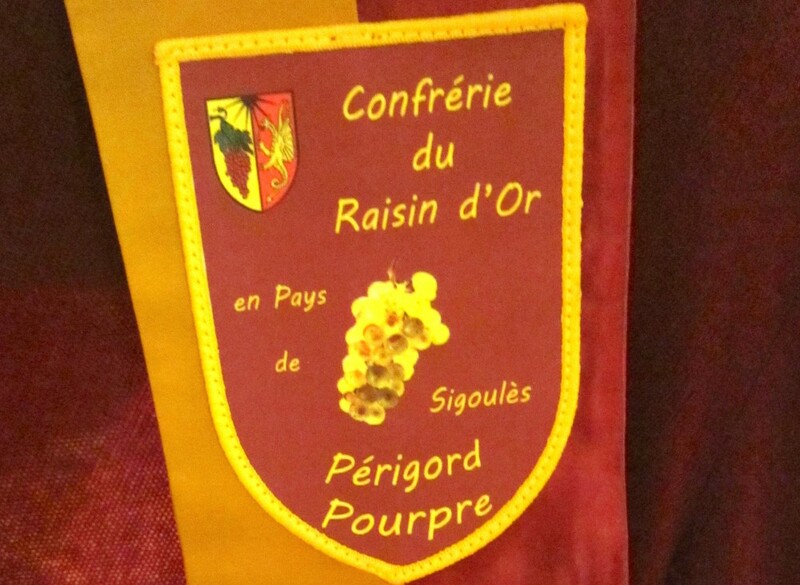 And our own Bergerac region is remarkable for the number of women making terrific wines. Not all of them are French. The legendary Patricia Atkinson of Clos d’Yvigne may have retired but the wines she made are still being produced by her successors. Le Rouge et Le Noir may be the best known, a classic blend of merlot and cabernet sauvignon but I also enjoy the wine she called le Prince, a blend of merlot and cabernet franc. And her book, The Ripening Sun, is strongly recommended as one brave woman’s account of a triumphant and often lonely struggle to make prize-winning wines from scratch. Not far from her vineyard at Gageac-et Rouillac near Saussignac is Chateau K, where the Norwegian Katharina Mowinckel may have given up her dream of becoming a world-class horsewoman, but now makes first-rate organic wines. The original name of the Chateau was Fougueyrat, but knowing that Scandinavia would be an important market, she decided that Chateau K would be easier to pronounce. And the Chateau K wines she makes are very good indeed, as you might expect from this lovely corner of the Bergerac. Her cheaper wines, called simply K, are also good value. My friend Sylvie Chevallier produces lovely wines at Les Hauts de Caillevel, prize-winning Monbazillacs, charming wines and very serious red wines indeed. I was honoured to be on a jury where we were able to recognize the quality of her wines and then I had the pleasure of getting to know her when we were both promoting Bergerac food and wine in Switzerland, when the traveling Lascaux museum was on show in Geneva. And now Sylvie has been elected the apolitical chair of the tourism committee of our regional council, a fine choice. I just hope it leaves her sufficient time to continue producing her splendid wines. And like more and more Bergerac wines these day, they are bio-organic certified. She calls herself ‘a peasant winemaker’ but her wines are noble indeed. Brigitte Soulier at Chateau la Robertie makes wines so good they are served at the Vieux Logis restaurant in Tremolat, my own favourite place to eat. Her Monbazillacs are a treat but I have a great fondness for her red wines, which add a little Cot (the old Perigord name for Malbec) to the usual Cabernet-Merlot blend. If you have not yet visited Caro Feely at Saussignac, you should. Caro runs wine courses and lunches and with her husband Sean makes very fines wines indeed. If you get hold of their red wine called Grace, treasure it for a few years. But also enjoy the view from their home over the Dordogne valley all the way to Bergerac. I had the pleasure one evening at Sean and Caro’s home of meeting their neighbor, Isabelle Daulhiac, who with her husband Thierry make some of the best value Bergerac Sec white wines that I know. I cannot possibly leave out Nathalie Barde of Chateau le Raz or Sylvie Deffarge Danger of Chateau Moulin Caresse (a name that perfectly describes the smoothness of her red wines) but I am running out of space. And then there is our local TV superstar, Gaelle Reynou-Gravier of the Domaine de Perreau at St-Michel-de-Montaigne, in the Montravel district of Bergerac. She is the model for Gaelle Dumesnil in the latest version of Le Sang de la Vigne (Blood of the Einre) French TV series. In the latest episode, she is the inspiration for the role of the childhood sweetheart of one of the stars of the series. But the real stars are her two special wines, a wonderfully deep red called Desir Carmin and an enchanting Desir d’Aurore, which I consider the best Chardonnay wine produced in the Bergerac. Martin Walker, author of the best-selling ‘Bruno, chief of police’ novels, is a Grand Consul de la Vinée de Bergerac. Formerly a journalist, he spent 25 years as foreign correspondent for The Guardian newspaper and then became editor-in-chief of United Press International. He and his wife Julia have had a home in the Périgord since 1999 and one of his great hobbies is visiting the vineyards of Bergerac. I hear the buzz of conversation before I see the people. Mid morning chat is at a gentle hum as people from across London and elsewhere greet each other and settle down to the serious business of a portfolio tasting courtesy of Davy’s Wine Merchants established in 1870. I have been thinking about historical context quite a bit recently, so I am distracted by considering the age of this business and thinking about what was going on when Davy’s Wine Merchants was established. A time of upheaval and change in Europe with revolutions in the mid century and the unification of Italy a year later. Queen Victoria was well established on the English throne and the Victorian writers: Trollope, Dickens, Elliot, Hardy were writing books that have become classics of English Literature. I admire the skill and tenacity required to build and sustain a business over that length of time: 146 years. Certainly, it speaks to the ongoing public interest in enjoying quality wines. So back to the business at hand: sampling some of the wines presented by wine producers and/or the Davy’s Team. It’s an impressive sight in the Hall of India and Pakistan at The Royal Over-Seas League house in St. James’s, London. 31 Tables with over 250 wines presented representing all the classic wine growing areas of the Old and New Worlds and developing wine growing areas such as England itself. It would take a great deal of time to do justice to the large selection of wines at this tasting. After walking around the room and looking at all 31 tables, I resolve that the only way to take advantage of this opportunity is to be selective in my approach. I taste a number of wines presented by Jean Becker from Alsace in France. Their Pinot Gris 2013, soft, with peach fruit aromas; Gewürztraminer 2013, violets and very floral aromas, Riesling Vendanges Tardives Kronenbourg 2009, smooth, honeyed, acidic, and excellent for sweet and sour dishes. I move on to Bodegas Miguel Merino Rioja, from Spain and really enjoyed the Miguel Merino Gran Reserva 2008, a beautiful rioja nose on the wine, smooth and long. Italian wines from the organic wine producer, Azienda Agricola Montauto, in Maremma, Tuscany are something new and stand out wines for me. Their winemaking philosophy is to make wines that support food, not overpower it. I particularly enjoyed their white wine: Montauto Vermentino Malvasia 2014. There is considerable length to the wine, with deep and balanced fruit aromas. At 13% alc./vol it is a very drinkable wine. Vermentino and Malvasia are grape varieties typical of this area in Tuscany along with Trebbiano and Grechetto. Sauvignon Blanc from neighbouring France has found a natural home in the area too. The Maremma area of Tuscany looks like an area worth visiting for its natural beauty, historical interest and microclimate supporting viticulture and the organic wines themselves. As a final tasting experience, I can’t resist the Fine Wine Collection hosted by Davy’s staff and in this instance by wine consultant, Martin Everett MW. I look at the line up of wines and notice that a Monbazillac AOC wine, a late harvest botrytized wine from the wider wine region of Bergerac is included; a Monbazillac Chateau Fonmourgues 2009. The red wines at this Fine Wine Collection table are Bordeaux classics, both Left and Right Bank. I focus on the right bank, Pomerol and St. Emilion. Château du Tailhas, Pomerol 2012, located near Château Figeac, and Château Beau-Séjour Bécot, Grand Cru St. Emilion. 2006 – a special vintage- and taste these wines. When I look at my notes, all I write is “ Beautiful”. When I taste these top of class, prestigious Bordeaux wines with their full and satisfying flavours and aromas, I am always transported back to other occasions when I have enjoyed them. On this occasion, I think back to 2009 and a visit to both Château Figeac and Château Beau-Séjour Bécot. What struck me at the time was not just the quality of the wine but the accessibility and congeniality of the proprietors, in each case with family members at a multi-generational helm. I remember at Château Figeac, Madame Manoncourt, the co-proprietor with her husband, rushed up to meet us as we were leaving. She had just driven back from Paris, a considerable distance, yet insisted on taking the time to welcome us to the Château. In reading the history of Château Figeac, the Manoncourts were one of the first Châteaux owners many years ago to open their doors to general public or non trade visitors. That sincere interest in the consumer is what good customer relations is all about. Similarly, at Château Beau-Séjour Bécot, which we also visited in 2009, Monsieur Bécot joined us on our tour of the Château and the cellars and went to great lengths to explain their approach to making their wines. It’s always the people who make the difference. Peeling back the onion rings of memory, these experiences make me think of teenage visits to Bordeaux with my parents many, many years ago, when the proprietors always took the time to show us around yet the visits had to booked then by correspondence some time in advance. I remember at that time we visited Château Palmer and Château Margaux among others. All these thoughts and memories come flooding back as a result of attending the Portfolio Tasting of Davy’s Wine Merchants, an organization with a long history and family lineage. Enjoying wine, especially excellent wine, is always an evocative experience for me of other times, places and people. It’s a time machine in a bottle.